This collection of essays comes as the first British Institute of International and Comparative Law publication in the field of international humanitarian law in over a dozen years. It was inspired by extensive work of Lady Hazel Fox and Mr Michael Meyer as well as the Institute's Discussion Group in the area of international humanitarian law, which resulted in the two books in this field in 1989 and 1993. Contributors to this volume are Professors Charles Garraway, Leslie C Green, Michael Newton, Michael N Schmitt, Col Kenneth Watkin, Dr Roberta Arnold and Dr Robert Cryer. 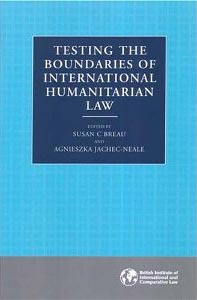 The Institute?s IHL team, Dr Susan C Breau and Agnieszka Jachec-Neale, also contributed to this publication. This new book explores the important and topical subject of 21st century conflict and the implications for international humanitarian law. Areas covered include in-depth analyses of such topical issues as terrorism and complex security situations, legal fault-lines, contemporary warfare, post-conflict management and in particular problems relative to occupation, interrelations between humanitarian law and human rights, and the Security Council use of IHL. A special part is dedicated to the creation and role of the Iraqi Special Tribunal. "Testing the Boundaries of Int'l Humanitarian"